4.3 out of 5 based on 20 bloggers and 27 commenters. 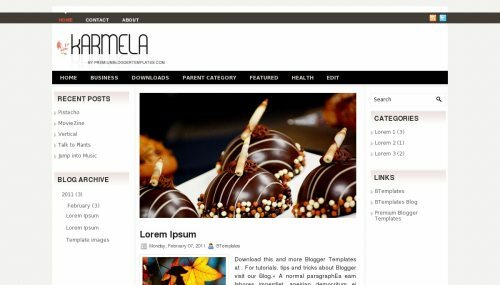 Karmela is a free blogger template adapted from WordPress with 3 columns, magazine-styled, left and right sidebars, ads ready, slider and posts thumbnails. The template looks very bad, try to fix things. Hello! Should you explain how to change the menu (black toolbar) in your template? Change the name of the menus and link to our proper pages? I really like your template but I can’t use the different possibilities it offers! You must change those URLs by yours. The font size in my blog is too big. how should I change it? @atm: I which part of your blog do you want to change the font size? I want the word ” The Airborne Geek ” to appear in a single line, and have a background image, which covers the the full header area. I`v tried editing the HTML but no avail. I cant change the font,text color and its alignment.Its left justified it seems. Any image I add is distorted and not aligned. Pls help. The template is very good but The header is giving trouble. Change the 40% by 100% and save changes. You background image must be 950x110px. Please, let me know in which part of your blog do you want to change the font, text color and alignment. Thank you very much. as you could see, I was able to change the header text alignment.Looks much better now :-). however, the code for the background image is not workin out. Also, I want to change its font and color. Is there some CSS script that you have which I could edit in blogger? My bg image is 950 X 110 px. I`ve used the links from both picasa and photobucket. but the background remains the same , without any image. I guess you should really learn some etiquette and manners on how to interact in the web domain. plain criticism without useful suggestion helps no one. I get this error when i try to install your themes. I’m using softaculous. Need your suggestion that how it should be fixed. Also, I was wondering, if it is possible to change the css or whatever so the grey bar in the featured content slider is not as tall? I want to post only the name of the featured post instead of the details as well! Right now the grey area is taking a lot of space. If anyone could help me that would be awesome! Change the height (120px) by a lower value and save changes. Please help! What should I do/change? 1. How could I write to/in/below the certain menu items and how could I put the existing posts below the menu items? 2. How could I make more or less menu items and mainly: more or less child categories to the certain menus? 4. How could I change the 5 intermittent pictures to the ours? Thank you again, I’m very-very grateful. – could you explain how to put posts below/linked the proper/different menus/pages and how to put the existing posts below the menu items? – and how to change the colors of background of primary menus(background of parent titles)? Hey, why did you moderate my questions? @Claudia: Is there anyway that you can change or delete the “read more”? I want to use the blogger jumps so that my RSS feeds can be shorter, but that results in two jumps. Alternatively, is there a way the html can be changed so the font is white or something? how do I delete or change the top bar where the icons are twitter and rss? Is this comment section still active? I had a question about setting up the Featured Post Gallery.